Grilled Foods & Beer: A Pairing Guide. Nothing goes better with grilled food than some good beers (okay, sometimes a good sangria will work too) and this article gives you some great pairing ideas for beer and grilling menus. Check it out and give them a try! i know I will! It’s a Pork Chop Thursday! This is another quick and easy recipe, perfect for a weeknight dinner when you don’t have a lot of time. it is Pork Chops Agrodolce with a Herbed Bean Salad. If you want to make the whole meal really quick, you can make the bean salad a day ahead, or skip the bean salad all together and go with rice or noodles as a side dish and have a vegetable (I made green beans). This recipe is a nice mix of sweet and sour flavors with the honey and the balsamic vinegar for the glaze for the pork chops. I got the recipe from Williams-Sonoma. Season the pork chops with salt and pepper. In a large nonstick skillet over medium-high heat, warm the olive oil. Add the chops and cook, turning once, until golden brown, 3 to 4 minutes per side. Transfer the chops to a plate. Reduce the heat to medium. Add the honey, balsamic vinegar and thyme and cook until the liquid is thickened and reduced by half, about 5 minutes. Stir in the broth and bring to a simmer. Return the chops to the pan, cover and cook for 3 to 4 minutes. Uncover and cook, turning the chops occasionally and basting with the sauce, for about 15 minutes more for medium doneness. Transfer the chops to a platter and cover loosely with aluminum foil. Increase the heat to medium-high and simmer until the sauce is syrupy, about 3 minutes. Remove the skillet from the heat and stir in the butter until incorporated. Season with salt and pepper. Drizzle the sauce over the pork chops and serve immediately with the herbed bean salad. Drain the beans and rinse with cold water. Place in a Dutch oven and add the thyme sprigs, onion and bay leaf. Add water to cover the beans by 3 inches. Bring the pot to a boil over medium-high heat, reduce the heat to medium-low and simmer, uncovered, until the beans are tender, 45 to 55 minutes. Discard the bay leaf, thyme sprigs and onion. Drain the beans into a colander and rinse with cold water. In a large bowl, whisk together the shallot, oregano, basil lemon juice and olive oil, and season with salt and pepper. Add the beans and stir to coat well with the vinaigrette. Adjust the seasoning with salt and pepper. You could serve the bean salad warm or cold, whichever suits your tastes best. As I said, if you wanted to make this a really quick weeknight meal, you could make the beans the day before or skip them all together and make other sides instead. For tomorrow’s dinner, Sean really wants to have the Popcorn Shrimp, so I think that is what I am going to make. I’ve never made it at home before, so it should be interesting. Check back tomorrow to find out how it goes. Until then, enjoy your evening and enjoy your meal! How To Grow Herbs: Indoors and Outdoors | Healthy Eats – Food Network Healthy Living Blog. I just started growing a few of my own herbs recently, and it really does make a difference in flavor and saves you the cost. While it’s not the easiest thing in the world for some people (me included, we live in a condo, not much room here for anything! ), this article gives you some tips on things that are easy to grown and try. Check it out! It was a very simple meal tonight which was great since we are in the middle of a thunderstorm and didn’t quite know if the power would hold out long enough to cook (thankfully it did). This is an easy recipe that I picked up from Williams-Sonoma and makes great use of some fresh herbs to add some great flavor to the steak. The recipe calls for rib-eye steaks, but I had bought a porterhouse on sale a few days ago and used that just fine. I am pretty sure any cut will work, so use what you like best. I served it with some corn on the cob, brown rice and some of the leftover pistachio salsa from the weekend (which is still quite yummy by the way). In a small bowl, stir together the rosemary, thyme, salt, pepper, red pepper flakes, garlic and olive oil. Reserve 2 teaspoons of the herb paste. Rub the remaining herb paste over both sides of the steaks. Let the steaks stand at room temperature for 30 minutes. Preheat a cast iron fry pan over medium-high heat for 5 minutes. Place the steaks in the hot pan and cook, turning once, for 2 to 3 minutes per side for medium-rare. Transfer the steaks to a cutting board and brush the tops of the steaks with the reserved herb paste. Cover the steaks loosely with aluminum foil and let rest for 5 minutes. Slice the steaks thinly across the grain and serve immediately. Serves 4. It’s a quick and easy dinner for a weeknight, which we love! We were also able to make use of some leftovers, which is always a good thing too. Tomorrow is Wednesday, which is my busiest day of the week, so I can’t guarantee a post tomorrow, but I’ll give it a shot :). I have a choice of things to cook, between pork chops, shrimp, ribs and burgers, so I am not sure which way I am going to go with it yet. Burgers would be the easy way out; the ribs may take more time than I have to devote on a Wednesday. We’ll see how it goes. Until then, enjoy your evening and enjoy your meal! It turned out to be quite a busy day yesterday, so I didn’t get a chance to do any blogging at all, so I will try to make up for it now. We ended up having some family over yesterday, so I was able to use the chickens that I bought the other day and try out a new recipe. I got this recipe from Bon Appetit and I think it turned out really well. it was Roast Chickens with Pistachio Salsa, Peppers and Corn. Admittedly it was a little warm out here to have the oven running, but it was worth it. For the chickens: Whisk the lemon juice, oil, garlic, 3 tablespoons of thyme, rosemary and sage in a small bowl; set marinade aside. Season the chickens with salt and pepper inside and out. Place each chicken inside a resealable plastic bag; divide the marinade evenly between the two bags. Spread the marinade evenly over the chicken to distribute. Seal the bags and chill for at least 4 hours and up to overnight. Preheat the oven to 450 degrees. Transfer the chickens from the bags to a small roasting pan; gently blot the excess oil from the marinade with paper towels, leaving the herbs intact on the chicken skin. Stuff each chicken with a lemon half and several thyme sprigs. Tie the chicken legs together with kitchen twine, if desired. Roast the chickens until well browned, about 30-35 minutes. Reduce the heat to 350 degrees and continue roasting, occasionally basting the chickens with the pan juices, until an instant read thermometer inserted into the thickest part of the thigh registers 165 degrees, 20-30 minutes longer. Transfer the chickens to a carving board; let the chickens rest for 20 minutes before carving. For the peppers and corn: Heat the oil in a large skillet over medium heat. Add the onion and capers. Season with salt and cook, stirring occasionally, until the onion is soft but not brown, about 5 minutes. Add the peppers and the chiles; season with salt and cook, stirring occasionally, until soft, about 10-12 minutes. Stir in the caper brine, corn, parsley and vinegar just before serving. For the pistachio salsa: Combine the first 4 ingredients in a small bowl. Stir in the oil until blended. A couple of notes on the meal. The peppers and corn turned out a lot spicier than I thought it would, so you can either tone down the chiles or eliminate them, or if you like it hot, leave it that way. It was pretty spicy, but I made some brown rice to go with the meal and if you mixed it in with the rice, it did tone done the heat some. Secondly, you can make the pistachio salsa ahead of time and cover and refrigerate it for up to 2 days before serving. Just let it come to room temperature before you serve it. I made a nice fruit salad for dessert made of watermelon, blueberries, strawberries, mango, pineapple and kiwi that was delicious and I had quite a bit of watermelon leftover, as well as watermelon juice, so I decided to make a refreshing cocktail for a hot day. Mix together the sugar and salt if using. Wet the rim of a chilled martini glass with a piece of watermelon. Dip the rim into the sugar and salt mixture. Repeat for another glass. Place the watermelon juice, vodka, triple sec, and simple syrup into a cocktail shaker. Top with ice. Shake well. Pour contents through a strainer into martini glasses. Garnish with a wedge of watermelon if desired. It is very tasty and refreshing if you want to give it a try. I think it’s a great adult drink for the summer. Finally, I had asked a question on here and on my other blog, http://www.theofficeofiguanaflats.com about where you would go on a picnic and what you would bring. I got some interesting answers, but most of them seem to tend towards the same thing of a nice, quiet backyard-type setting with lots of grass, lots of shade and lots of good food. There are so many places to choose to go for a nice picnic, I don’t know that I could pick an exact place. I can say that I too would like a nice quiet, grassy setting, someplace shaded by trees but enough so that some sun can break through and give you the nice warm feeling on your face now and then. There are probably settings like this all over, in any park or mountain hideaway. it would have to be somewhere where it wouldn’t get too hot, maybe near a lake that you could take a quick dip or do some fishing before you picnic. As for what I would bring, I would take a nice picnic basket with a comfy blanket to sit on or lay on. There would have to be some fresh fruit involved, maybe a fruit salad or just a mix of some berries and melon. I would want to make some chicken salad sandwiches, or maybe even better some peppery bacon, lettuce, tomato and avocado sandwiches on some nice fresh ciabatta bread, some really fresh half sour pickles and some fresh, homemade potato salad. I could even go lighter and just bring a fresh loaf of crunchy french bread, some really fresh, off the vine tomatoes, a little salt, some arugula and some good extra-virgin olive oil and just have some sliced tomato and pieces of bread with a little bit of the oil, yum yum. Of course we would have to have a bottle of wine, something light I think, probably a white that you would have chilled to serve with your picnic. I think that would be great. Thanks again to everyone who answered and a special thank you to Geoffrey Zakarian, Scott Conant, Gael Greene and MyLastBite.com for offering up their answers. If you’re interested, you can check out today’s question at http://www.theofficeofiguanaflats.com to see what it is and answer if you would like. Today’s is also somewhat food-related, so you might like it. That’s it for today. We’re taking it easy tonight and just having pizza, so there is nothing special going on in the kitchen tonight. I do hope to make the Sicilian Steak tomorrow, so check back for that. Until then, enjoy your holiday weekend and enjoy your meal! I also have a whole chicken and some ribs but have not yet figured out what I want to do with any of it yet. If you didn’t see the recipe from last night, I can tell you that we loved it and we’ll be cooking it again if you want to check that one out. Since the summer season is upon us, if you were going on a picnic and could go anywhere you wanted, where would you go and what would you bring? Let’s assume you could go any place you want and bring anything you want. There are lots of places to choose from: beaches, parks, the mountains, a deserted island, your rooftop, the Eiffel Tower, it could be any place. Somewhere that you can relax and enjoy your picnic with whomever you want, or by yourself if you choose. Think about what you would want to bring – it can be anything as decadent or as light as you like, a nice bottle of wine, some fine cheese, or just some sandwiches or hot dogs, whatever makes you happy. Think about it and let me know. You can answer on here, or on Facebook or Twitter. I’ll also ask some people on Twitter and see if they respond. I’ll post my answer tomorrow. I know it’s a short blog post today, but we’re just having leftovers tonight from the past week and I’ll be cooking again tomorrow, so check back then and see what I can come up with to eat. I have some good stuff to choose from, so I’ll see which recipe is going to be good for tomorrow (I am leaning towards the Sicilian Steak). Until then, enjoy your evening and enjoy your meal! I had planned to grill today, but the weather just isn’t cooperating here in New York. It’s been cloudy and rainy for almost four days now, so there hasn’t been any cooking outside for me. So here I was, stuck with all these chicken pieces and not a thought on how to cook them. I decided to turn to Twitter and see what some famous chefs could come up with for me. America’s Test Kitchen suggested chicken and dumplings or a chicken pot pie, Geoffrey Zakarian suggested a stir fry, but Scott Conant suggested a method that stood out best to me so I decided to go with it, with some slight alteration on my part. Preheat the oven to 375 degrees. Toss the potatoes and onions with the paprika, salt and pepper and a teaspoon of the olive oil. Heat a large skillet over high heat until it’s very hot (Scott Conant actually said “screaming hot” so make it very hot!). Add the remaining olive oil and heat until smoking. Pat the chicken dry with paper towels and season well with salt and pepper. Add the potatoes, onions and chicken, skin side down to the skillet. Season with thyme, rosemary and red pepper flakes. Sear the chicken until the skin side is well browned, 7 to 8 minutes. 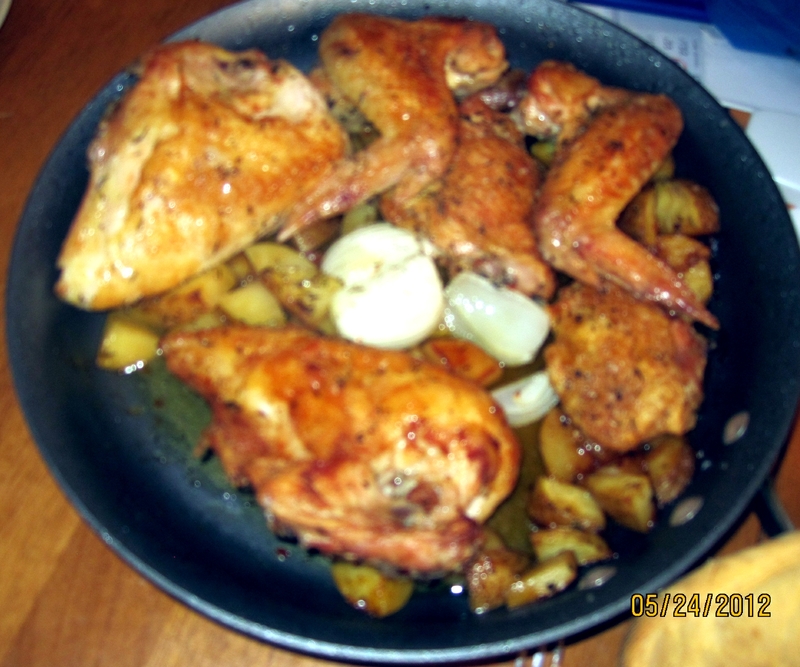 Turn the chicken over, stirring the potatoes and onions also, and place the skillet in the oven. Bake the chicken until an instant read thermometer inserted into the thickest piece reads 165 degrees, about 40 minutes. Remove from the oven and serve. Scott actually suggested leaving the whole thing on the stove, covered and cooking for 45 minutes until crispy but I thought it would turn out better in the oven so I threw it in there and it finished crisping up better and the meat was juicy, so it worked for me. I served it along with some fresh green beans, and that was it. So a big thank you to Scoot Conant for helping me out today with dinner. I plan to do my week’s shopping tomorrow with Sean’s help, so we’ll see what kind of recipes I can come up with for next week. Check back and see what we come up with. Until then, enjoy your evening and enjoy your meal!